Zhang Fei's black attacks have no range restrictions. Zhang Fei's red attacks can target an additional player. If Zhang Fei gets a colorless attack through another character's ability, like Chen Gong's "Brilliant Scheme", that attack would get the benifit of neither of Zhang Fei's powers. It would only be normal. Zhang Fei cannot use both powers at the same time since the attack card cannot be both red and black. When Zhang Fei uses "Tiger Roar", the additional target must also be within his attacking range. 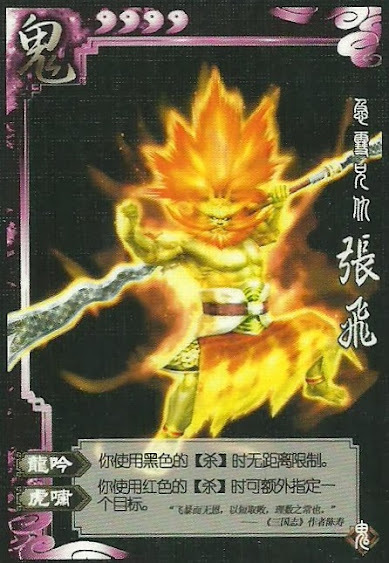 If Zhang Fei uses "Tiger Roar" with the Sky Scorcher, both effects are combine to target up to four separate people. All of whom must be in attacking range of course.